Actress Lori Loughlin was taken into custody by the FBI Wednesday in Los Angeles after she, fellow movie star Felicity Huffman, and 48 others were charged in a $25 million college admissions scam. ABC News said the repercussions are being felt from Hollywood to the boardrooms of major corporations. A former cast member on the ABC sitcom Full House, Loughlin and Oscar-nominated actress Huffman, are among 33 parents charged with conspiracy to commit mail and wire fraud in the nationwide scam to get their children into elite colleges, including Yale, Stanford, Georgetown and the University of Southern California. Social media is abuzz over this case, and many are wondering whether anyone will spend time in jail for their crimes. For some, it’s another example of the difference between when the White “elite” are charged with crimes compared to poor people of color. “Kelley Williams-Bolar and Tanya McDowell enrolled their children into Public School Districts in which they did not reside,” one Twitter user with the handle @dlnodots wrote. “They were both jailed for these crimes. Should Felicity Huffman and Lori Loughlin be held to that same standard?” the user wrote. Others on social media concurred with @dlnodots. 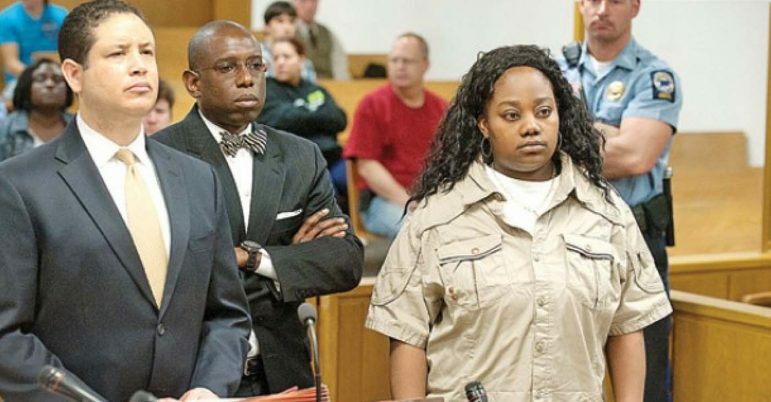 In 2011, Williams-Bolar, a Black woman, was sentenced to 10 days in county jail, three years of probation and $30,000 in restitution for lying about her residency to get her daughters into a better school district in Ohio. For McDowell, the punishment was worse. “[McDowell] got 12 years for sending her six-year-old son to Norwalk, Connecticut’s Brookside Elementary School while she ‘lived’ in Bridgeport, even though she was homeless,” said Bishop Talbert Swan, an activist and pastor. “She was convicted of first-degree larceny for ‘stealing’ an education,” Swan said. When McDowell was sentenced in 2012, she vowed to continue to fight for a better education and life for her young son. Authorities said that her charges were compounded by the fact that she twice sold drugs to an undercover police officer. The convoluted case left some scratching their heads, while others who had previously supported McDowell began to step away when the drug charges surfaced. Some observers suspected that because of the “stealing” education case, the homeless woman was targeted and set up by authorities, including a relentless cold-hearted prosecutor. “Who would have thought that wanting a good education for my son would put me in this predicament,” McDowell, 34, said at her sentencing where she received 12 years in prison with seven years suspended. “I have no regrets seeking a better education for him, I do regret my participation in this drug case,” she said. Norm Pattis, a trial lawyer who said he’s fighting for freedom “one client at a time,” recently wrote a sobering blog about the McDowell case. Pattis, who practices law in Connecticut, said the system owes McDowell. “I hope Tanya McDowell will forgive us, someday, for our hypocrisy and cruelty. I hope her son will as well. But first she will have to serve her prison term. Her son will have to learn to get along without her,” Pattis said. Experienced criminal defense lawyers know the charges faced by McDowell often go hand-in-hand with life circumstances: “An addict has to steal, often, to support their habit,” Pattis said. However, McDowell was no ordinary drug user, he said. “She did not steal to support her habit. She stole an education from the City of Norwalk. Yeah, that’s right. We now send people to prison for theft of an education,” Pattis said. McDowell was living by her wits with her kindergarten-age son, spending time where she could, most often in Bridgeport at homeless shelters. “Norwalk prosecutors, known statewide for an unreasoning mean-streak, obliged. She was charged with first-degree larceny,” he said. At that point, McDowell had become something of a folk heroine and public support rallied behind her. Then the undercover cops moved in. “Just who sent them and why they targeted her is as yet unclear. She bought some narcotics, and was then charged as a drug user. Public support for her vanished,” Pattis said. “Why, the woman self-medicates? A homeless shelter isn’t good enough for her? She struggles being a single mom? Maybe she’s got mental health issues? And what’s this about wanting a better life for her son? Let’s warehouse her,” he said.